Dust off those morning coats gentlemen; and ladies you need to pull out your best Sunday bonnet. It’s time to celebrate like its 1867! Well, not really! But, if you’re one of the millions of Canadians planning to celebrate our nation’s 148th birthday, it is time to look at your bottom line and plan a fabulously frugal July 1st celebration. Canada Day is a perfect time to make new memories, enjoy time with the family, and celebrate the many wonderful things that make us proud to be Canadian. However, between barbecues, beer, festivals and fireworks, celebrating our great nation can quickly do a number on your family budget. Party from dawn to dusk – Make the most of Canada Day by celebrating from dawn to dusk. Community celebrations are taking place from coast to coast and in most cases it won’t cost you a penny to join the party. Those on the east coast can be amongst the first citizens to celebrate Canada Day at the St. John’s, Newfoundland sunrise celebration. When the sun sets on the west coast, citizens of Victoria, B.C. can close out the day with “A Flavour of Canada” celebration. Feast on flapjacks – What’s more Canadian than a few hot-off-the-grill flapjacks drizzled with maple syrup? Royal Canadian Legions across the country celebrate Canada day with a free (or minimum cost) pancake breakfast. Start your day off right with a full stomach and a little taste of Canadianna. Take the oath – On July 1st thousands of individuals will take the oath and become Canadian citizens. What better way to celebrate our nation’s birthday than to sing the national anthem with your newest fellow Canadians. Taking in a citizenship ceremony is not only free, but is also a great way to teach your kids about what it truly means to be Canadian. 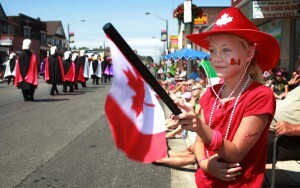 Toronto is known as the multicultural epicenter of Canada, with half of its residents born outside of the country. 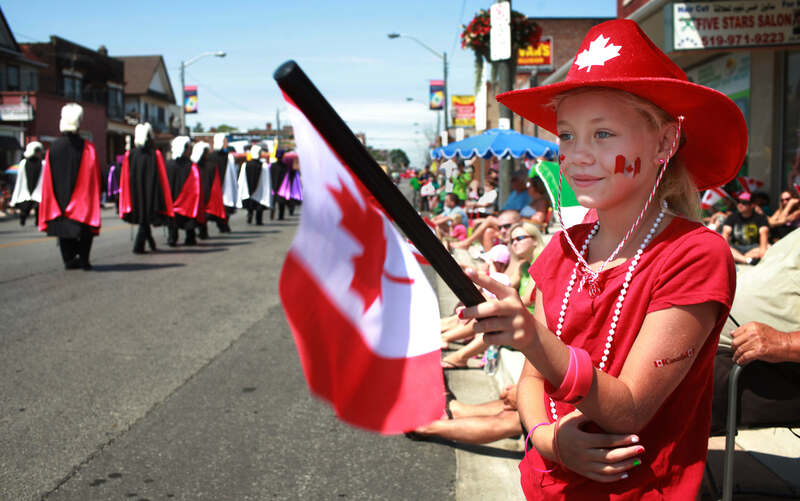 There are Canada Day citizenship ceremonies in several locations around the Greater Toronto Area, in municipalities such as Brampton, Markham, Richmond Hill, Mississauga, Ajax, and Vaughan. Groove to the beat – Nothing says Canada Day quite like an outdoor concert, but you don’t have to spend a fortune on tickets to see the Tragically Hip or Rush. Live music performances pop-up all over the country on July 1st, and concerts in Niagara Falls, Calgary, Montreal and Halifax are all free of charge to spectators celebrating our nation’s birthday. Throw a burger on the BBQ – If the idea of a crowded community festival is not your slice of cake, consider throwing a more intimate Canada Day celebration in your own backyard. Invite family and friends for a July 1st barbecue, but keep costs down by making it a potluck or BYOB. Sleep under the starts – Canada is home to some of the most beautiful landscapes in the world – and our national and provincial parks are some of the most spectacular places to be one with nature. Skip the city celebration for a more laidback Canada Day by camping under the stars and toasting marshmallows in honour of July 1st. While there is a cost to booking a camping site, sleeping under the stars is a great way to make lasting memories while sticking to a budget. Light up the sky – As day turns to night, close out your Canada Day celebrations by taking in a fireworks display. There is no need to spend a fortune on your own fireworks when there are phenomenal shows in communities across the country. From Newfoundland to British Columbia, Canadians will be lighting up the sky – but there is no display quite as extravagant as the one on Parliament Hill. Free to anyone who shows up, fireworks in our nation’s capital are among some of the best in the world. We live in a great country, which makes it difficult to avoid getting caught up in extravagant Canada Day celebrations – but while your painting the town red this July 1st it important to keep your budget out of the red. With a little planning, and by keeping these tips in mind, Consolidated Credit wishes you and your family a fun, festive and frugal Canada Day!